The Household came about at the S.C.A. Canton of Cluain’s Festival of Saint John of Jerusalem in 2004. Two young siblings had seen the event mentioned in the local newspaper, and, as they had always had an interest in things Medieval, decided to go and see what it was all about. There they met Geffrey ðe Wulf (Geoff Boxell), who had been involved with the S.C.A.’s Canton of Cluain for three years and who worshipped at the same Chapel as the youngsters. Naturally he offered to be their help & guide, with the grateful thanks of their father. More events followed, and, as Gef was acting in loco parentis, it was decided that they should create a backstory that made them actual family: Geffrey ðe Wulf as uncle to Gareth Robertson and Guinivieve (“Gwen”) Roberts. Soon Guinivieve was courted by, then engaged to, and finally married to another member of the Canton, Lachlan McLachlan. So, now four, they called themselves “Wulfings”, meaning “those who are associated with one called ‘Wulf". In the S.C.A., anyone can form a household, which is a group of friends who share interests and decide to group together within the S.C.A. Thus the Wulfings declared themselves a household, with the backstory of being 14th Century Lollards based in the Wandle Valley near Wandsworth, Surrey, England. Lollards were a proto-Protestant, Christian group that had no formal organisation and held a variety of non-conforming beliefs. The foursome also started performing English folk songs together. As time went by, others asked to join them, and, as these newcomers were of an age that, under S.C.A. rules, requires an adult guardian when attending S.C.A. events, they were classed as “Wulflings”: junior members, or “little Wulfs”. More came, also underage, and the class of “Retained Archer” was created for these warlike young men. Yet more folk joined, and the Wulfing Household, which had archery and entertainment as its main focuses, now includes artisans with a wide diversity of skills and a variety of backgrounds. The backstories tend to converge on the Tower of London in Middlesex, as this is where Geoff Boxell’s ancestor Sir Alan de Buxhall – Knight of the Garter, King’s Councillor, and a cunning man of dubious methods, who was Constable of the Tower of London, for both Edward III and Richard II. The Tower provides a point at which all the Household’s personae, with their varying backgrounds, might have met in history. Whilst not all the Household are Christians by today’s standards, the Household is led by Christians, and functions on Christian principles as this would be a historically accurate moral code by which to live. The Wulfing banner above is divided into these parts: 1st- The arms of St Eadmund King & Martyr (patron Saint of English archers and one time patron Saint of England). 2nd A wolf's head (appropriate not just for Wulf's name, but also a wolfhead is an outlaw and some of the things they do for Sir Alan are outside the law). 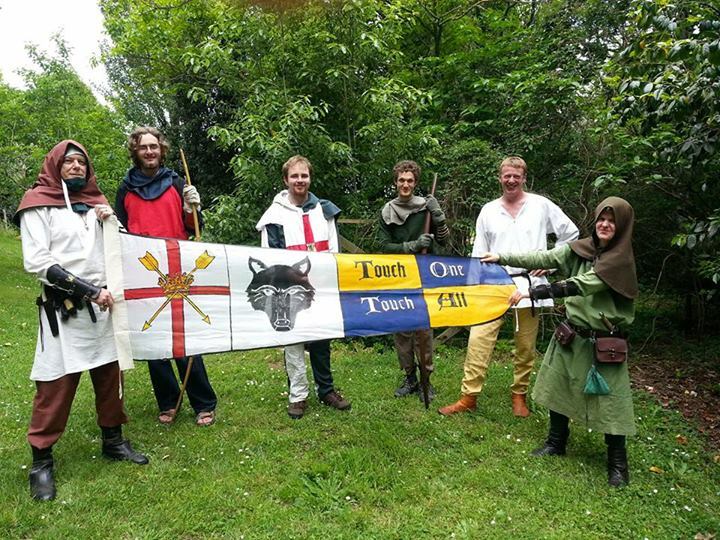 3rd the Motto "Touch One: Touch All" - which is what a pack of wolves and Wulfings practice for protection) with quartered colours from Sir Alan's livery badge. See this page for pictures, backstories and tall tales about the Household.